US band Guilty As Sin could best be described as progressive death metal, and death metal itself has been described in author Nigel Latta’s “Politically Incorrect Guide To Teenagers” book as being like a wall of distortion and screaming: “If you took Beethoven, covered him in metal bolts, fed him into a jet engine, and then revved the whole thing up, you would get some idea of how death metal sounds!” Like it or hate it, that is probably a fairly accurate description of that musical genure, and many of the tracks on Future History do indeed bring to mind Beethoven, bolts and jet engines to mind. However, as was the case with 2011’s Psychotronic, Guilty As Sin have chosen to temper their distortion and screams with a dash of progressive rock, which may be appreciated by Aural Innovations readers who make it past the first few tracks. Guilty mainstays Zak Ovian (drums), Dan Madam (guitars) and Ryan Dilbarian (bass), have added lead vocalist (and author of the distorted screams) Steve Milionis into their pyrotechnic mix, which has tended to enhance their death metal aspirations more than their progressive side. Statement of intent album-opener One Way Ticket To Oblivion holds back to a mere breakneck speed, but I hate Hipsters (“I hate hipsters, and I hate you!”) and R.S.D.T.Y. (with its Ramones-style “1234” countdown) are so short and sharp that they barely register, taking less than two minutes each to put you through their musical meat grinder. Ensnared by Stygian Tentacles stretches out a little, with a nice “eastern” guitar solo reminiscent of Rainbow’s Stargazer played at 45rpm. Magical Papyri Of The Tetragrammaton and Midnight Hammer are the two most progressive tracks, the former a nine-minute epic with spoken-word vocals, the latter a seven-minute instrumental workout which gives Ryan Dilbarian a rare chance to shine (bass solos being none too common in death metal), and containing time-changes aplenty; as with the best tracks on Psychotronic, you could almost be listening to Dream Theatre on steroids or Rush at their heaviest. Death From Alpha Centauri contains more death than it does Alpha Centauri, with a harsh Throbbing Gristle noise collage acting as a coda. Most baffling of all is the closing title track, featuring muted trumpet and trombone over programmed beats and scarcely a guitar or scream in hearing range. When it comes down to it, only card-carrying death metallers are likely to find real enjoyment (an oxymoron?) 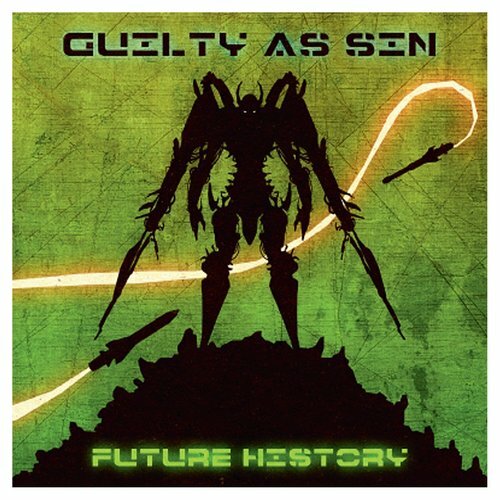 in Guilty As Sin’s visions of future history. However, those that do may be pleasantly surprised at how the band have managed to avoid sticking resolutely to that one-dimensional formula.